This journey is truly the most rewarding way to travel from Gisenyi to Kibuye. Quietly passing the coast, we stop first at Cyimbili – where we can witness the full lifecycle of Rwanda’s famous coffee, from islands covered with bushes to a cup of delicious coffee. Our next stop is at Kinunu where there is a small guesthouse and a wonderfully romantic lodge set with breathtakingly scenic views. Continuing down the coast we spend our final night on a beautiful, uninhabited island, which is still mostly covered with natural woodland that teems with birdlife. And then paddling through the deep azure waters of Lake Kivu’s ‘Bay of Islands’ we island hop past many more uninhabited islands – including Napoleon island with its famous bat colony – before arriving at a hotel in Kibuye. beans growing on the bush to a delicious cup of locally grown and made coffee. But first we travel gently along the shoreline soaking up the quiet and beautiful scenery. Near Cyimbili we find lovely views of the coffee islands from the water and can optionally go on a short paddle around them in the afternoon. The guest house isrun by Alarm-Rwanda that is promoting reconciliation in the local community. They also sell their excellent coffee! ​Day 2 is a gentle paddle along the coast, where bays and inlets provide an interesting and very scenic setting for our journey. We arrive at Kinunu in time for lunch, and in the afternoon, we take an optional trip around Bugarura island, one of the largest Rwandan islands in Lake Kivu. We can land on the island to see its church, old mosque and open market – but what's special is that it offers what is perhaps the most scenic, panoramic view on the whole of Lake Kivu. Day 3 starts with a remarkable view towards Lake Kivu’s ‘Bay of Islands’ with Kibuye and many hills rising into the distance. We may circumnavigate Bugarura Island Island before continuing along the coast to a beautiful uninhabited island. Still mostly covered with native trees numerous species of birds dart in and out of the foliage. Take the afternoon to admire the island and the birdlife, or we can go on a short optional paddle deep into an interesting inlet on the mainland. Then in the silence of the lake, the following morning we wake to a dawn chorus that is truly remarkable. 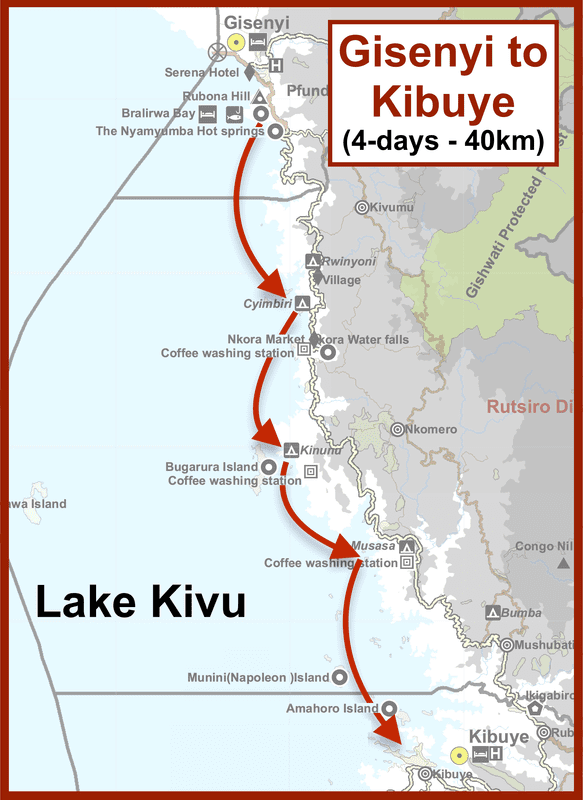 Day 4: After a simple breakfast, today is for many people the highlight of our journey to Kibuye because it sees us paddle through Lake Kivu’s ‘Bay of Islands’ a beautiful setting unlike anywhere else in the country. If we did not visit Napoleon Island on Day 3, we will go there today, stopping to marvel at the bats that fight amongst themselves for the best roost. We then ‘island hop’, perhaps stopping off for a swim in the crystal clear and impressively clean, fresh water to cool off. Before reaching Kibuye, we may call in for lunch on Amohoro (Peace) Island, where there will be time to contemplate just how special the past few days have been. Then, in the afternoon it’s just a short paddle to Bethany or Cormoran Lodge where we finish. Dinner & breakfast on the camping island: we prepare for you a delicious simple meal on the open fire. We also supply a simple lunch on the last day. If you deselect this option, you will need to bring all your own food and cooking equipment.